Mons is located in Belgium, about 30 miles south-west of Brussels and about 20 miles west of Charleroi. It is a location associated most with 1914 - the first British contact of the War, the Battle of Mons on the 23rd of August and of course the famous "retreat from Mons", when the BEF had to fall back, almost in panic, in late August and early September after the Germans crossed the canal. The Retreat meant the British marched from near Mons to near Paris in just two weeks. As well as the association with 1914, Mons is also a location which saw action at the very end of the war. This cemetery is rightly hailed as one of the most beautiful and striking war cemeteries on the Western Front. 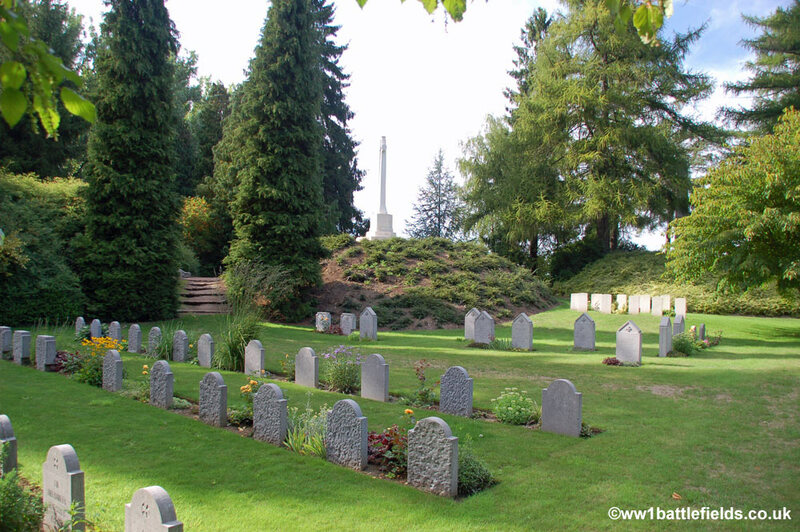 Located down a small quiet track to the east of Mons, steps lead up to the cemetery entrance. From here, there are three routes forwards; with gates to the right and the left leading into the cemetery and steps straight ahead leading to a monument in the form of an obelisk. The gate to the left bears the cemetery name in German, and that to the right shows the name in English. Soldiers of both nationalities are buried here. Climbing the steps straight ahead, however, leads to the obelisk. This is located on an artificial mound that pre-dates the cemetery, and the cemetery was in fact designed around the mound. The obelisk (see photo above) at this highest point in the cemetery was erected by the Germans in memory of both German and British servicemen killed in the actions near Mons on the 24th and 25th of August 1914. From the obelisk on top of the mound there are good views to the right and left across the cemetery which was designed to resemble a park, with separate and distinct areas for groups of graves. 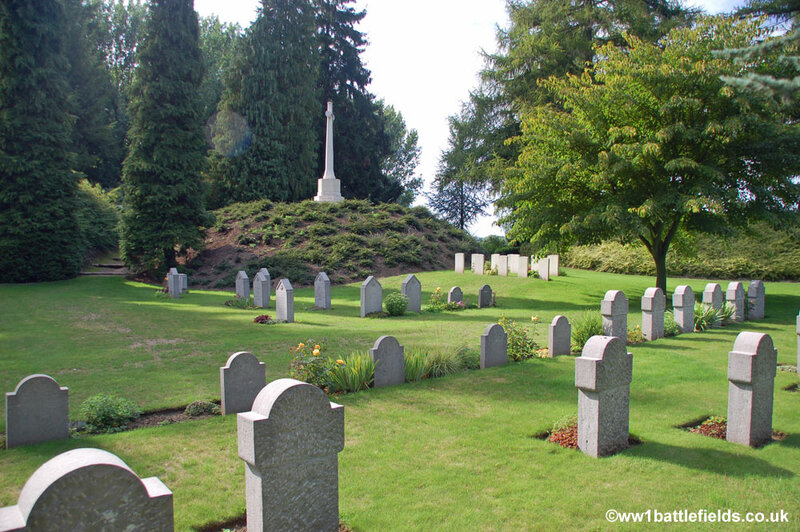 The cemetery was originally started by the Germans in August 1914, after the Battle of Mons. 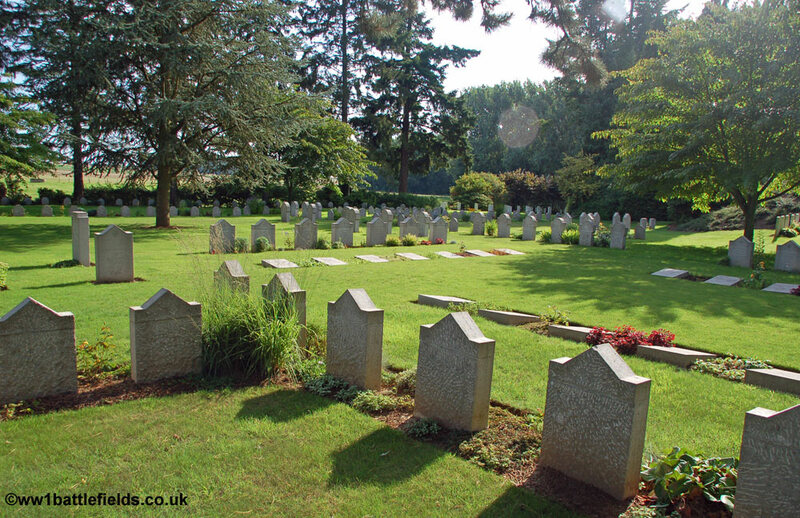 By the Armistice there were 245 German and 188 Commonwealth graves here, but this number was later added to by the concentration of graves from a number of other burial sites and cemeteries. There are in total a little over 500 graves here today, with 229 Commonwealth burials, and 284 German graves. As one walks through the cemetery, small plots of graves come into view between the trees, each laid out in a different way and with surrounding features and vegetation that also differ, reinforcing the impression of an ornately designed park or garden. In the main German plot on the left side of the cemetery, there are several different designs to the headstones, some of which are shown in the photographs below. One which stands tall is that of Leutenant George Rutergut. 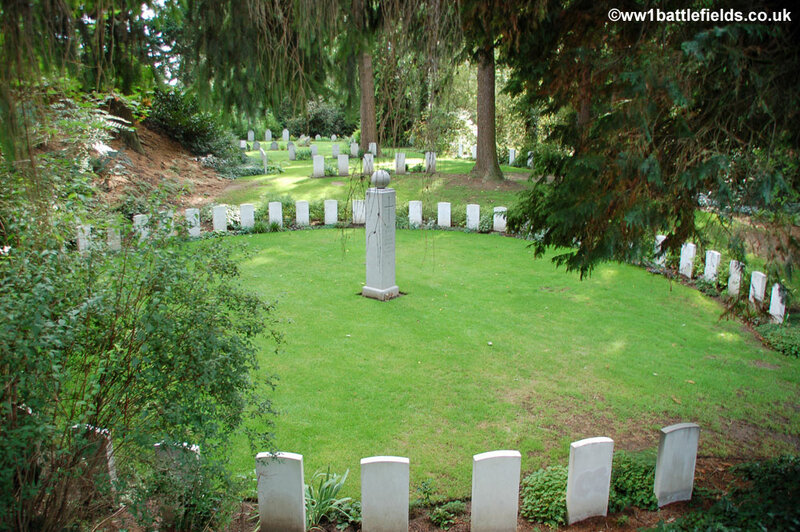 There are more German graves immediately behind and below the central obelisk memorial, and six plots containing the British and Commonwealth graves are found behind and to the left of these. 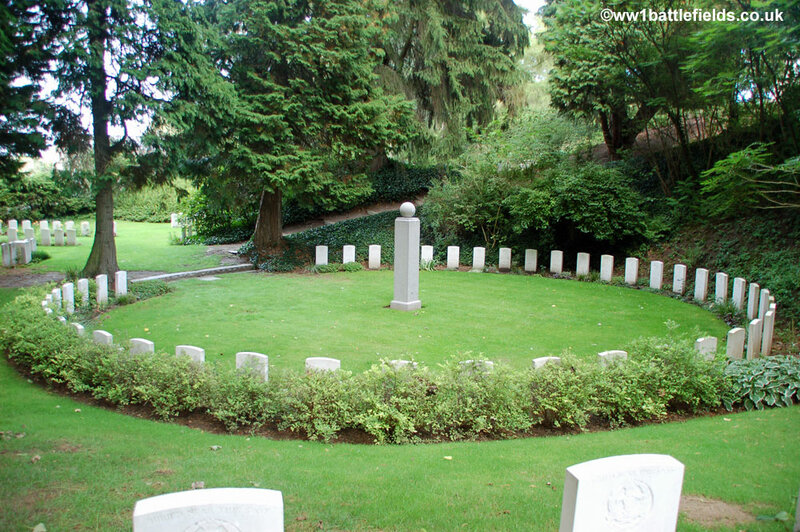 In Plot 2, toward the back right, there is a large stone set behind some of the graves, and Plot 3 consists of a circle of headstones around a tall memorial, in the form of a column surmounted by a ball. This is the Middlesex memorial. 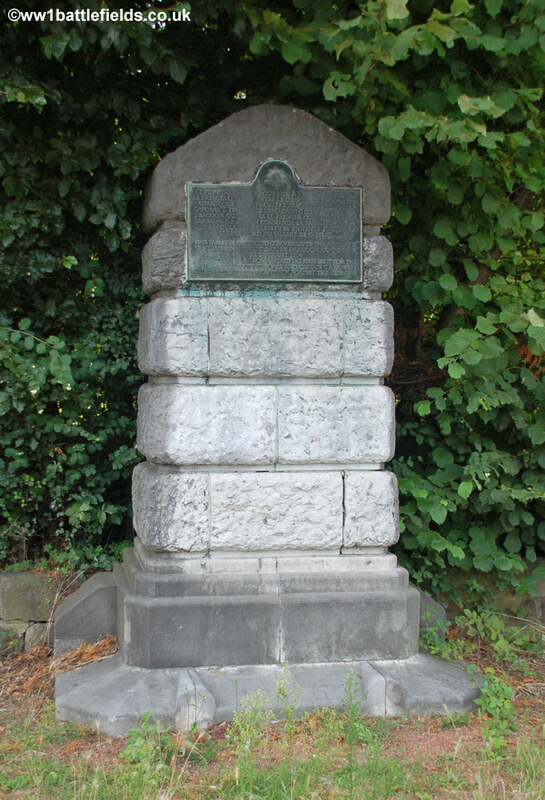 This memorial was again erected by the Germans, to commemorate the officers and men of the Middlesex Regiment, and the column bears a cross and the simple inscription "Here repose 46 English soldiers of the Royal Middlesex Regiment". Another memorial, also erected by the Germans, can be found up some steps which are opposite the Cross of Sacrifice. 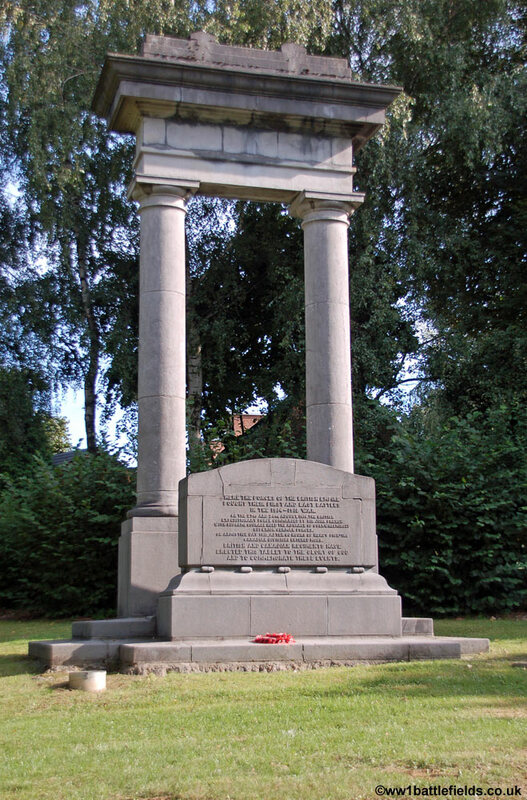 This is the memorial to the Royal Fusiliers and Royal Irish Regiments; again it is in the form of a column, and is located at the end of a long horseshoe of headstones, with a seat behind it. In faded letters on this column is the inscription "Here repose 53 English soldiers of the Royal Fusiliers and of the Royal Irish Regiment". The Cross of Sacrifice itself stands on another mound, smaller than the main one but still rising above the British and German graves. Steps lead up to it from Plot 6. As well as the memorials mentioned above, there are a number of interesting graves within the cemetery, including, by anecdote at least, those of the first British and last Imperial forces soldiers to die in the Great War. 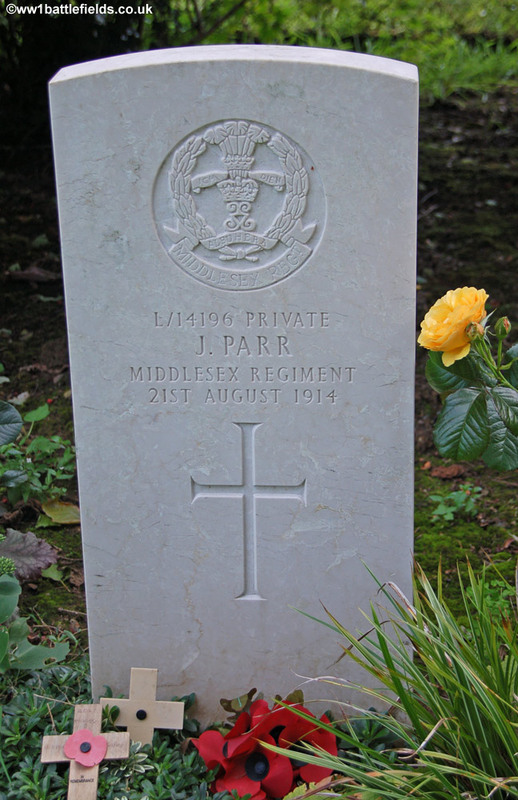 The former is Private John Parr of the 4th Middlesex, who was killed, aged 20, on the 21st of August 1914 according to his headstone, although there is some dispute about whether he died that day or the day after. 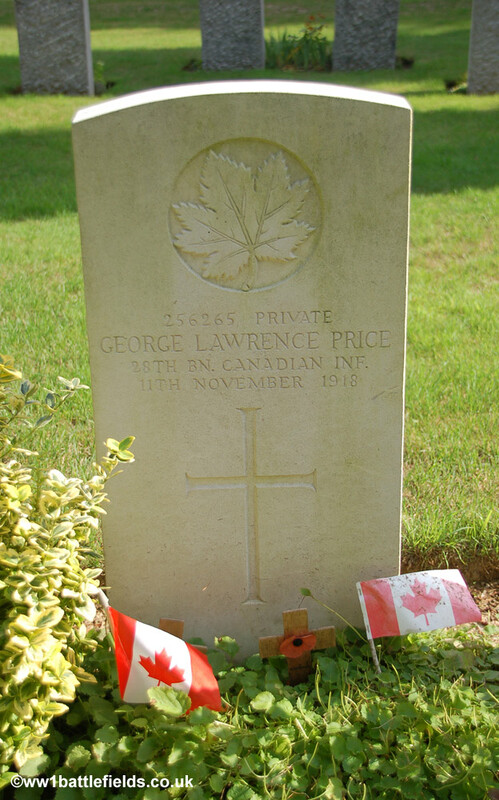 Private George Price, a Canadian soldier of the 28th (Saskatchewan) Regiment, is reportedly the last Imperial force soldier to die in action in the Great War; he was killed at 10:58 a.m. on the 11th of November 1918 by a German sniper. The last believed British battle caualty is also buried here; Private George Ellis of the 5th Irish Lancers who was also killed on the 11th of November 1918. 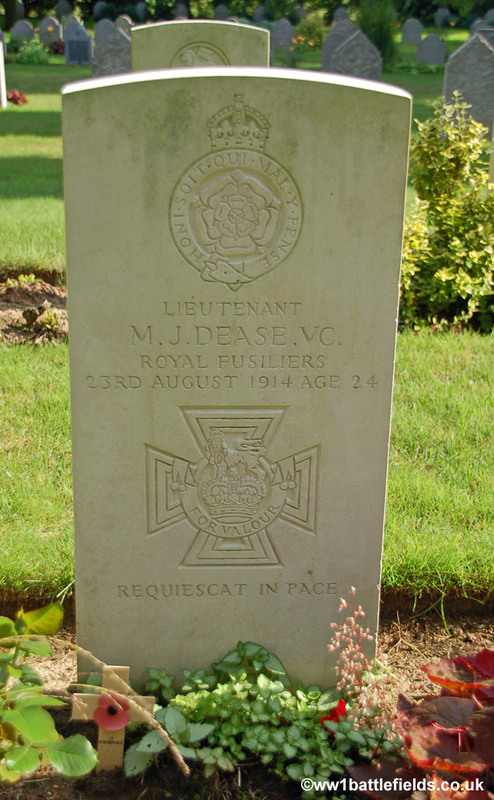 The man who won the first Victoria Cross of the war is buried here too: Lieutenant Maurice Dease, of the 4th Royal Fusiliers. He won the VC and died on the 23rd of August 1914, manning a machine gun at the Nimy canal, not far from where he is now buried. Private Sidney Godley was also awarded the VC for this action, and he survived, although he was wounded and captured by the Germans, spending the rest of the War as a prisoner. As stated earlier, Mons and the area around saw fighting at the very beginning and the very end of the war. Not far from Saint Symphorien cemetery on a cross-roads between the N90 and the N40 stands a memorial to the first and last battles fought by forces of the British Empire. The road is busy so it is best to turn off the main N90 road and park on the side-street near by. The memorial is in the form of two columns surmounted by a horizontal structure, with a plaque in front. This commemorates the first battle, at Mons on the 23rd-24th of August 1914, and also the last, when Canadians entered the town on Armistice Day after "60 hours of heavy fighting". A memorial to the Royal Irish Rifles is also located by the same cross-roads. 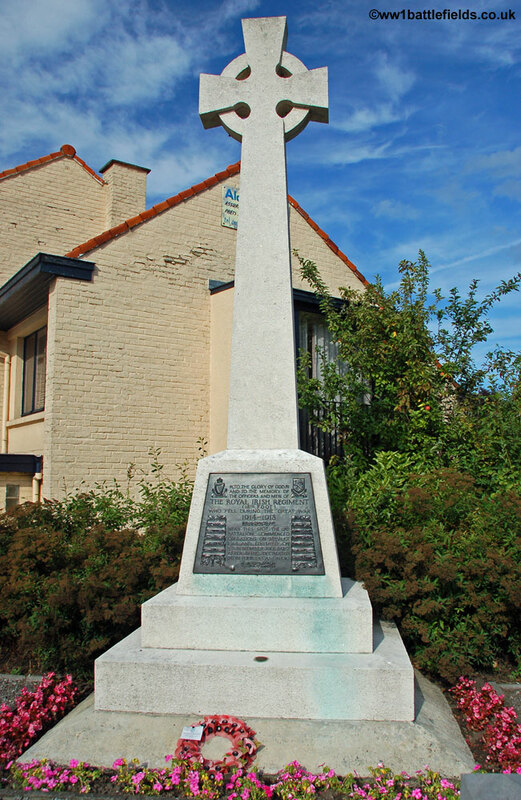 The RIR memorial is in the form of a Celtic cross, with a bronze plaque at the base which lists the battle honours of the regiment and also states "Near this spot the 2nd Battalion commenced operations on the 23rd August 1914 and finished on 11th November 1918 after being decimated on four occasions". 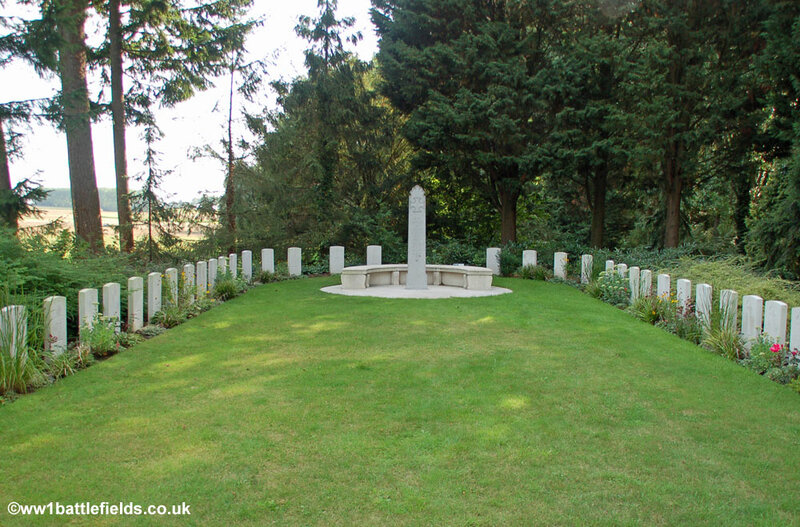 About three miles to the north-east of Mons, on the main N6 road that leads to Soignes, are two memorials commemorating the first and last shots of the Great War. On the left hand side as you head away from Mons is the First Shot Memorial. This is a short blockwork obelisk which is now sadly in a poor state of repair, and is set back in the bushes by the side of this farily busy road. The text on the plaque, first in French then below in English states "This tablet is rerected to commemorate the action of "C" Squadron 4th Royal Irish Dragoon Guards on 22nd August 1914, when Corporal E. Thomas fired the first shot for the British Expeditionary Force, and Captain C.B. Hornby led the first mounted attack against the Germans". Between the 12th and 17th of August, the BEF had been crossing the channel to France. They then travelled to the area near Mons and were largely in position by the 20th. On the 22nd, 'C' Squadron sent out two patrols from Obourg in the direction of Soignes, and here they encountered a German piquet, on which they fired, forcing the Germans to retreat. Ironically, the memorial was unveiled in 1939, just before the start of the Second World War. 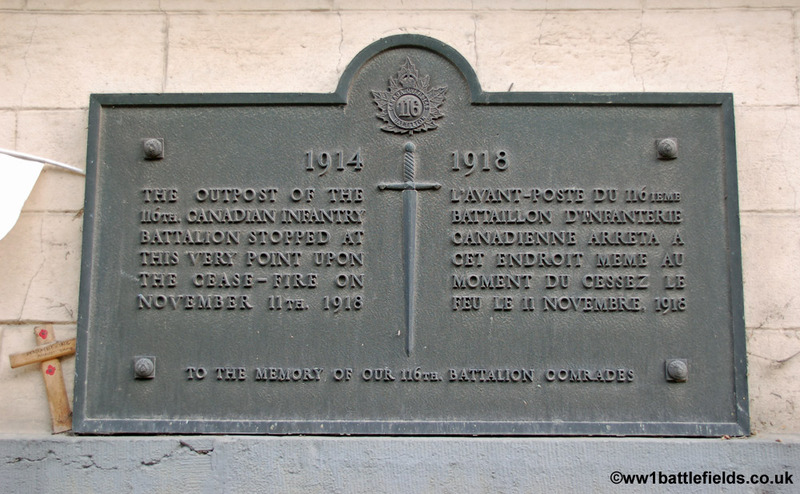 On the opposite side of the road is a plaque on the wall of a restaraunt (Le Medicis) commemorating the spot where the 110th Canadian Infantry Battalion stopped at the moment of the armistice on the 11th of November 1918. The plaque is on the right hand front of the building. Also located on the N6, a little further towards Mons, is a church on the left as you head towards Mons. This is Maisieres church, and on the wall is a plaque which (in French) commemorates men from the BEF who died here on the 23rd of August, 1914. 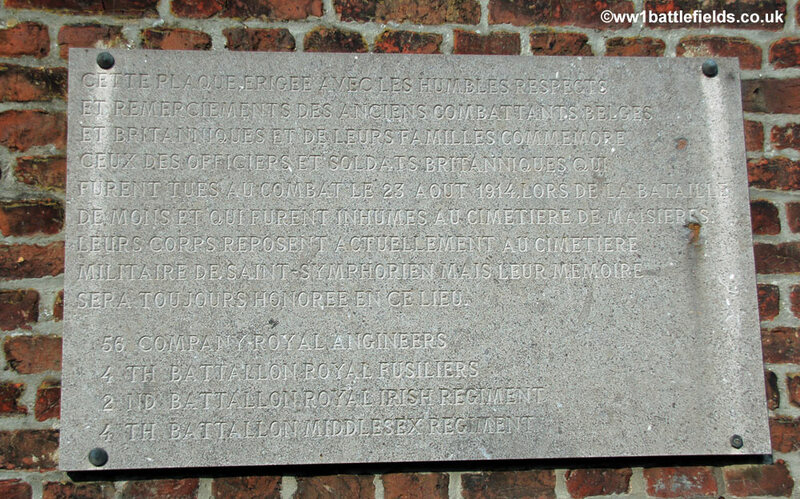 Specifically, the plaque mentions men from the 56th Company Royal Engineers (here spelt 'Angineers'), the 4th Battalions of both the Royal Fusiliers and the Middlesex, and the 2nd Battalion of the Royal Irish Regiment. 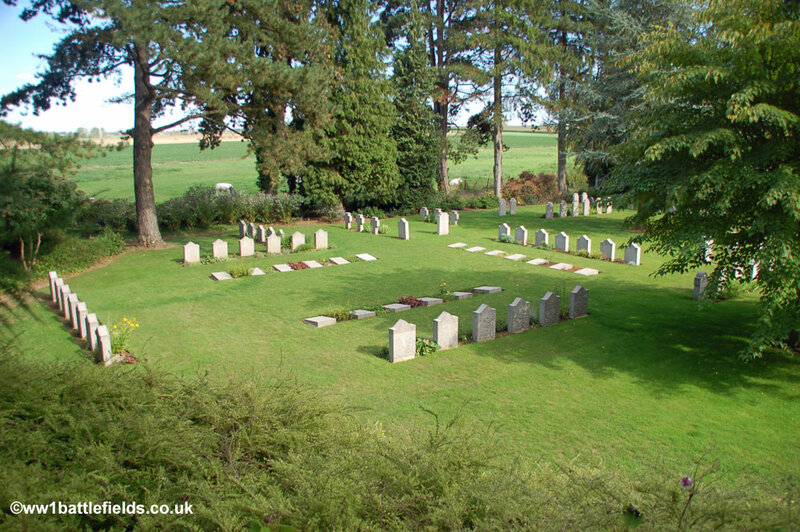 These men were originally buried in the cemetery here at Maisieres, although their bodies were later moved to the cemetery at Saint Symphorien (see above).